Tendenza is one of the most sought-after wedding venues in Philadelphia. With its impeccable industrial chic feel, it attracts more and more couples looking for a unique place to get hitched. Located in the heart of Nothern Liberties, it is just minutes away from Philadelphia most famous landmarks. The closest location that we would recommend for portraits, is Race Street Pier. With a magnificent view of the Ben Franklin Bridge, this spot is mindblowing. It works perfectly for bride and groom portraits together as well as big bridal party and family formals. Another great option for wedding photographs would be the Merchants Exchange building, which is a 5-minute drive from the Race Street Pier. Featuring the cobblestone foreground and a stunning marble building, this location is created so the most romantic, airy wedding photos. It serves as an amazing backdrop both for wide angle dramatic shots as well as for more intimate dreamy close-ups. If you are wondering if you can have both your wedding ceremony and reception at the same venue, and have it look absolutely different and unique, Tendenza got you covered. The photo above is a perfect representation of this scenario. Bride and groom were having their Jewish candlelit ceremony with around 170 guests. The space looked out of this world. 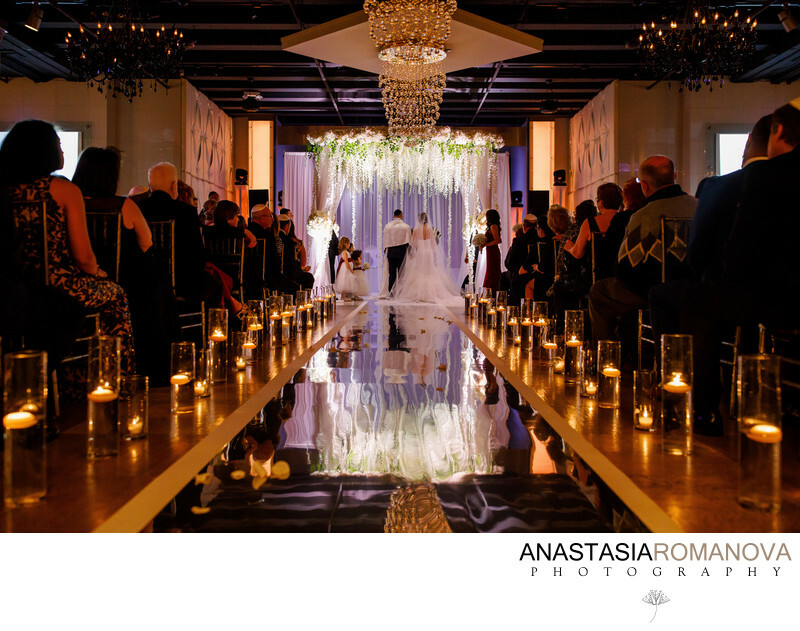 The floral design team did an amazing set up with the mirrored aisle that has floating candles lined up on both of its sides. The chuppah was decorated with an abundance of cascading flowers and a soft white uplighting. Once the ceremony was over, the room was quickly flipped to the wedding reception ballroom with even more sophisticated and stunning decor.